What To Do If Your Car Has Been Stolen | Calgary Alarm Inc. 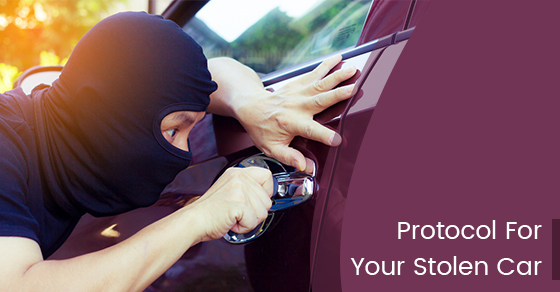 According to the Insurance Bureau of Canada, a car is stolen every seven seconds in Canada. If you’ve checked the parking lot multiple times only to have it finally set in that your car has been stolen, it is important to act immediately. Here is what to do if your car has been stolen. Call the Police. File a report with them and be sure to write down the report number. They will ask you for some information, including: your contact information, the make, model and year of your car, the vehicle identification number (VN) and when and where you last saw your car. Call your insurance company and file a claim. They will ask for similar information that you gave in your police report, as well as the police report number. This can increase the likelihood that you will be able to find your car if you have a clear image of the thief via your home security camera. Consider also speaking with business owners and ask them to access their security system if your car was stolen near their place of business. Go to Autocheck and get a vehicle history report for your car. This will give you a list of the places where your car was registered and serviced, information that can be useful in finding your vehicle. Sometimes, a car will be parked somewhere before it is abandoned. If your car was given a ticket, there should be a record of this in the database, which you should be able to access online. If your car is indeed in the database and you go to the location of the car, contact the police immediately if your car is there. Do not approach the car on your own. It is not uncommon for thieves to post stolen car parts on websites like Craigslist. If you notice parts from your car for sale, contact the police to accompany you to the seller’s house under the guise that you’re interested in the parts. Do not attempt this by yourself. Depending on your city, cabs generally outnumber police cars. It can be worthwhile to contact cab companies and ask them to be on the lookout for your car. Be sure to mention that a reward will be involved in the event that they find your car. Investing in a 24-hour monitoring service can help to protect you against theft. Consider Calgary Alarms for your choice of monitoring service — we are one of the best security alarm monitoring companies in Canada.